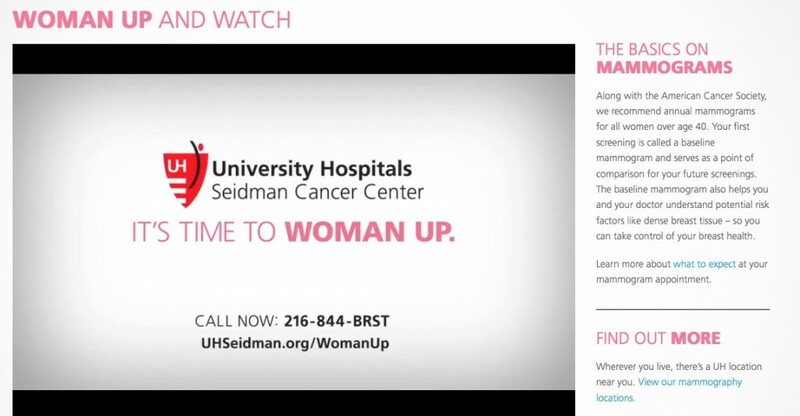 Cancer Center chastises women to persuade them to get mammograms, despite overwhelming evidence that screening mammography benefits fewer and harms more women than previously believed. Plastic Surgeons sell breast augmentation surgeries; objectify breasts; donate to “research.” As a massive consumer market, the number of plastic surgery procedures increases 5 percent every year. 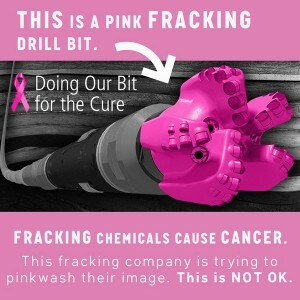 Largest breast cancer charity partners with one of the world’s largest oilfield service companies. 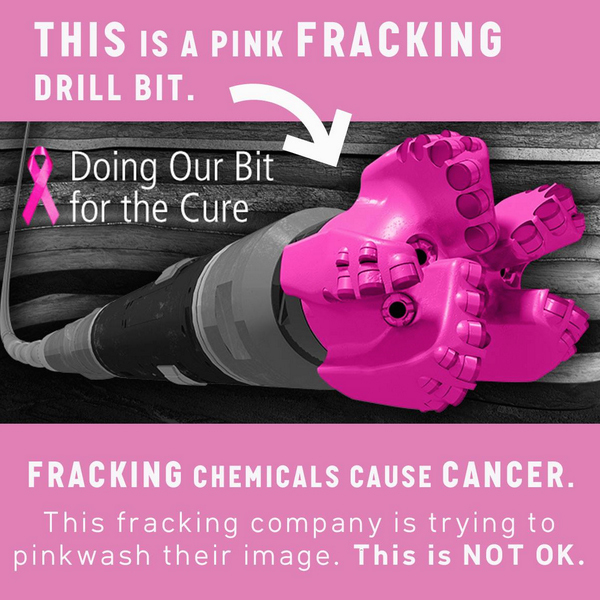 Awareness in a pink drill bit; carcinogens in fracking chemicals. As I reflect on this ilk masquerading as something useful, I find myself deeply troubled. There are so many well-intentioned people trying to make progress and a difference in the lives of those diagnosed with, and at risk for, breast cancer. How do they do it amid the refuse? How do they separate the wheat from chaff? How does anyone? I recently wrote in an op-ed for the Chronicle of Philanthropy — 3 questions missing most “awareness” campaigns— that need to BE answered, to try to address this. 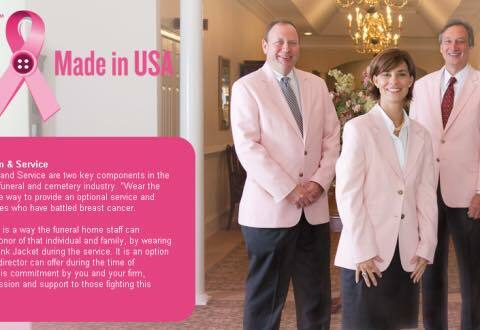 Do we know who profits from all those pink-ribbon products and how much of the money (if any) goes to research or to support the diagnosed? Do we know how much it costs to dress the NFL (or anyone else) in pink and who it really serves? Do we know whom to trust for independent, evidence-based information? There are more questions than this, but if we start with these we might gain traction. First published on Feminist Reflections on The Society Pages. I am a nurse practitioner and a breast cancer survivor. Diagnosed last year at age 37. I now see the medical community through different eyes. I have similar philosophies than those of Ms. Sulik. I am embarrassed for friends and family who donate to causes such as SGK where the money does not go to really researching cures. The cures are out there. But big Pharma is in our way. My question is…what are some useful charities that I can refer friends and family members to that will actually help and go to the right people?? Thank you for all of your hard work and dedication to raising awareness to what is really going on in the breast cancer community. Keep up the good work! 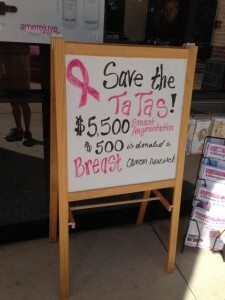 It can be very disillusioning to see such flagrant commercialization and even more difficult to sift through the thousands of groups and companies involved in breast cancer awareness activities. The information below might help you get started in determining what you think might be worth recommending to the people in your life who want to help. Money Magazine just did this article, highlighting five quality organizations. Here too is an article with Advice to Consumers regarding charities involved in cause marketing relationships. In addition to these, I’m an avid supporter of Breast Cancer Action, which saw the problem of commercialization more than a decade ago and has strong evidence-based materials. I also love Breast Cancer Fund‘s work on environmental linkages to breast cancer and its compilation of evidence. Alamo Breast Cancer Foundation in San Antonio runs an incredible program for breast cancer advocates parallel to the San Antonio Breast Cancer Research Symposium. SHARE focuses on breast and ovarian cancer, is evidenced based and comprehensive, while offering direct help as well (in English and Spanish). NY State Breast Cancer Support & Education Network (NYSBCSEN) is the only state-wide network of breast cancer organizations. Metastatic Breast Cancer Network focuses on metastatic (stave 4) breast cancer, has solid information and support services, and holds a national conference every year to promote collaboration among mets researchers and patients. METAvivor is the only group I know of focusing exclusively on METS research funding, is all volunteer. The Inflammatory Breast Cancer Network has an all-volunteer board and focuses on a rare type of breast cancer that gets very little attention in awareness campaigns since it is usually NOT found with mammograms and there is no lump. So start with these, and also consider what is available (or not) in your own community, including cancer centers. Let me know what you find.